MSPs on Holyrood's education committee have heard a raft of concerns from Scottish teachers about their training and the strain they are under. Trainee teachers said they were graduating without sufficient skills to teach maths to primary seven pupils. And more experienced staff warned of "overwhelming" strain, warning many will not stay in work to the age of 67. 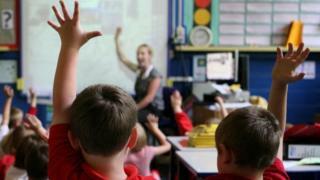 Education Secretary John Swinney said it was important teachers were trained well and supported within schools. And committee convener James Dornan called for "urgent assurances" from the General Teaching Council about the issues raised during the session. The education committee took evidence about workforce planning from more than a dozen trainees and more experienced teachers, the day after figures were published showing literacy skills of pupils had fallen over the past four years. Halla Price, who is in her final year of a BEd at Moray House at the University of Edinburgh, said initial literacy training was "very valuable", but was critical of training around numeracy. She said: "We spent a lot of time going over ideas of activities we could do. However, there wasn't enough focus on the teachers themselves having the skills to teach numeracy other than a maths audit we completed ourselves in second year, which did very little in all honesty to improve our own knowledge and mathematical understanding. "I do not believe that everyone graduating from Moray House this year has the sufficient skills in numeracy to be able to teach it to 11-year-olds at a reasonable standard." The university subsequently said that all of its training programmes were fully accredited and were in line with qualifications frameworks. William MacLeod, who is studying a postgraduate course to become a secondary technology teacher, said there was "a single week" of teaching focusing on literacy. However, he added: "I think literacy I would have less of an issue with, because literacy is being worked on throughout when we are doing essays, etc. "I would have more of an issue with numeracy because there is less chance for the university lecturers to see that we are numerate. Going back to the basics on these would be helpful." Members also heard from more experienced teachers, who warned few would stay in the profession until the age of 67 due to the strain staff are under. Isabel Marshall told MSPs she was stepping down as a head teacher after 33 years in the profession and 12 years as a head. She said: "I have thoroughly loved my career but I have resigned and I leave in six weeks. I have loved it but I am utterly exhausted. "It's been the breadth of social and emotional demands as well as the management demands which have meant I have reached that point where I feel I need to have a break." Image caption Isabel Marshall said she loved her job, but said she was quitting as she is "utterly exhausted"
Another teacher, Angela Kelly, said she and her colleagues felt "what is being asked of us is no longer sustainable". She said: "It's overwhelming and I feel many staff are feeling like they're juggling, and trying to prioritise is becoming more and more difficult because there are so many high priorities, and you don't know which one to tackle first or which one can be left for a few days." Linda Robertson, who became a teacher after working in industry, told MSPs: "I have never worked so hard. I can't imagine working to 67 at that level. Some days you can't even go to the toilet or have lunch. That's why you can't keep teachers." Convener Mr Dornan said "some of what we heard today about teacher training was pretty worrying". Mr Swinney said: "We have to make sure that in every respect we are attracting the right individuals into the teaching profession, that they are being trained well and educated well to deliver education to young people in Scotland, that they are supported within our school environment and that they continue to enhance their professional learning." The education secretary has been pressed on school workforce planning on several occasions in recent weeks. During education questions on 3 May, he said: "We are spending £88million this year to make sure that every school has access to the right number of teachers, we have increased student teacher intake targets for the sixth year in a row, and we are setting targets for training teachers in the subjects in which they are needed most. We are also supporting innovative new routes into teaching."